SKY LIGHTS – Page 536 – The only good night lights are billions of miles away. Answer: You were seeing two things. First, Earth’s shadow extends about 850,000 miles into space. That’s 3½ times the distance to the Moon. At the orbit of the Moon, this shadow is about 6000 miles in diameter — three times the size of the Moon itself. When the Moon passes through Earth’s shadow a lunar eclipse occurs. The photo above is an actual eclipse image taken when the Moon was 1/3 into the Earth’s shadow. As the line between light and dark advanced across the Moon, its curvature stayed the same. In a normal phase sequence this line first curves to the west, is straight at mid-cycle, and finally curves east. Early Greek astronomers saw the shape of eclipse shadows as proof the Earth was round. 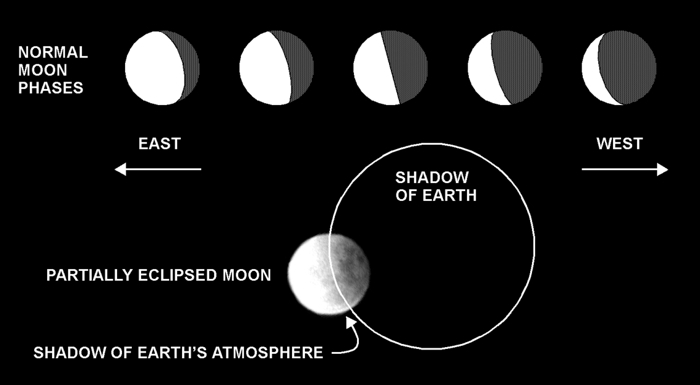 Note that normal phases of the Moon are not caused by the Earth’s shadow. Rather, they’re due to our constantly shifting view of the always half-lit spherical Moon as it orbits around us. The other thing you saw was how the division between light and dark wasn’t as sharp as it appears in normal lunar phases. During an eclipse, the Earth’s cloud-filled atmosphere casts its own shadow on the Moon, blurring this division.